In the wake of Trump’s election, some white, male liberals claimed that the problem for Democrats is that they are too concerned with civil rights for trans people and people of color, which they dismissed as “identity politics.” California runs starkly counter to that theory. 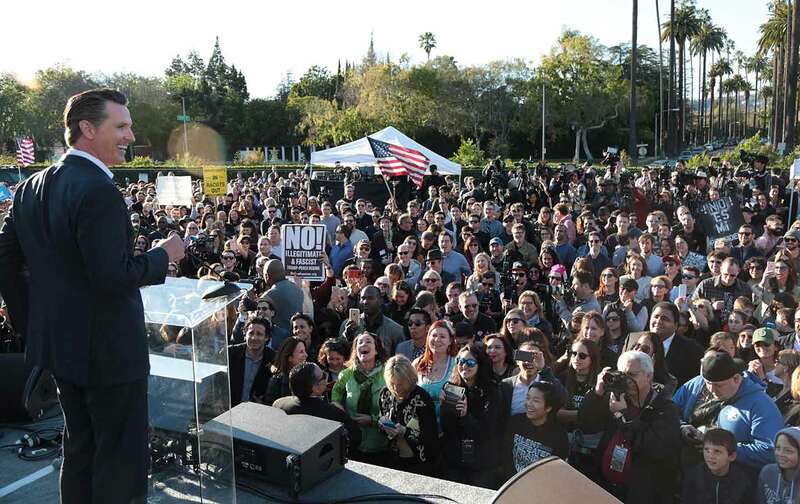 Progressives in California have melded social, racial, and economic liberalism together. Liberals in California have succeeded because they make it clear the politics of identity and civil rights are deeply tied to economic inequality. California shows how a cross-racial progressive movement can embrace identity politics without abandoning a commitment to the working class. Without a racial-justice and gender-equity analysis, populism can become Trumpism. But without class analysis, the politics of identity can easily devolve into a symbolic sheen disguising exploitative hyper-capitalism. California has implemented automated voter registration, a reform with the potential to enfranchise millions. The state has embraced the Affordable Care Act like few other states, and saw its uninsured rate drop by 11 percent, among the largest drops in the country. California has lead the nation in tackling global warming while taking equity seriously: Senate Bill 535 requires that 25 percent of revenues from the state’s cap-and-trade program must be spent on low-income communities. And, while conservatives across the country have bankrupted their states with tax cuts, California actually boasts a balanced budget due to tax increases. Governor Brown’s most recent budget increases spending on public higher education and child care. The state has lead the way on marijuana decriminalization, stricter gun laws, and civil liberties for the LGBT community. Following an incarceration boom, state voters passed propositions to decriminalize many drug and theft offenses, and limit “Three Strikes” laws, which resulted in lower prison and jail populations. Though it was once the symbol of whitelash, California has expanded the rights for undocumented immigrants far beyond any other state—extending in-state tuition, driver’s licenses and children’s health care to undocumented immigrants. While Republicans have worked to restrict the franchise in order to maintain white supremacy, some California cities have extended voting rights to noncitizens in local elections. Rather than facing backlash over the slew of progressive changes, the state’s governor and Democratic legislature are as popular as ever. In a poll conducted this January by the Public Policy Institute of California, Governor Brown’s approval rating is 62 percent, a personal best during his second stint in Sacramento. Notably, Brown boasts a 27 percent approval from Republicans and 59 percent approval from independents. Also according to PPIC, 57 percent approve of the California legislature, its best rating since 2001, and 58 percent say the state is on the right track—a measure that slumped to 15 percent as recently as 2010, following a recession and the onset of a major state-budget crisis. Over the next four years, expect California to play a big role in American politics. If Democrats are going to take back the House in 2018, they will almost certainly need to pick off the seven California Republicans who hold seats in districts that Clinton won (Jeff Denham, CA-10; David Valadao, CA-21; Steve Knight, CA-25; Ed Royce, CA-39; Mimi Walters, CA-45; Dana Rohrabacher, CA-48; and Darrell Issa, CA-49). Of the 24 seats Democrats will need to win to regain a House majority, California accounts for about a third of them. These California districts are the sort of diverse, college-educated places that are trending Democratic. Indeed, internal polling conducted by Darrell Issa’s campaign suggests that his association with Trump caused a ten-point drop in his favorability ratings. If Dianne Feinstein faces a primary challenge or chooses to retire, the battle will center around a vision for the future of the Democratic Party, since general-election success is virtually taken for granted in California. The special election in Georgia’s Sixth District will reverberate in California. Jon Ossoff, a dark-horse challenger in a solidly red district, has out-raised his opponents and leads the early vote (though this could easily change). An Ossoff win, or a narrow loss, would worry the 23 Republicans sitting in districts Clinton won. These Republicans managed to squeak out thin victories in 2016 but are coming into 2018 deeply vulnerable. The CA-34 special election, where more than a dozen Democrats are competing to replace newly minted Attorney General Xavier Becerra, suggests there won’t be a dearth of qualified candidates itching to challenge them. For 2020, there are at least two high-profile Californians that have shown some interest in running for president, Kamala Harris and Becerra. That makes sense, because California looks a lot like the coalition that Democrats will assemble to win the presidency and across the country moving forward. In a period of otherwise dispiriting national political malaise for Democrats, California is one bright spot. Despite currently being locked out of power at the national level, Democrats control supermajorities in both chambers of the State Legislature and all partisan statewide offices in California. That is, Democrats still control the sixth-largest economy in the world, and have the power to implement policy that affects nearly 40 million people. And California will be the epicenter of resistance to Trump—the state recently brought on Eric Holder to aid its efforts to protect sanctuary cities, defend its climate-change agenda, safeguard voting rights, and preserve the Affordable Care Act. In another move that will improve the state’s ability to maneuver in Washington, DC, Jerry Brown appointed Becerra, a twelve-term US House representative, to replace Harris as attorney general. In 2018, Brown will retire, and the Democratic gubernatorial primary will certainly hold lessons for the future of progressive politics. After the president, the governor of California is arguably the most powerful politician—and certainly the most powerful executive—in the country, particularly given the supermajorities that Democrats command in both state-level chambers. Lieutenant Governor Gavin Newsom has courted progressives with bold policies, pushing for universal health care and talking favorably about single-payer (a proposal Governor Brown views with some skepticism). Though Newsom comes in a favorite, a diverse group of other progressive challengers have emerged. John Chiang, who suspended the state’s relationship with Wells Fargo due to the bank’s customer fraud and oversaw a state-run retirement program (now under attack by the GOP) that helped workers without a plan at their job, recently scored a top-tier endorsement from Assembly Speaker Anthony Rendon. Antonio Villaraigosa, the former mayor of Los Angeles, is also running. He is known for his aggressively environmental governance. He increased the city’s renewable-energy mix from 4 to 20 percent and aggressively championed public transit. Delaine Eastin, the first woman to be elected as the superintendent of public instruction, is running to be the first female governor of California. Another possible contender is the president pro tempore of the State Senate, Kevin de León, a staunch gun-control advocate and former community organizer. In California, a multiracial coalition has emerged, and with it, a new vision of progressive politics has formed. This is a regional change as well: Sun Belt states that are already turning purple, like Arizona, Georgia, Colorado, and Nevada, will look at lot more like California than they will New England states. People looking for a vision for the future of the Democratic Party should look West. In the short term, its importance is clear: The ability of Democrats to make inroads in historically Republican, white-collar communities provides a clear path for Democrats to retake the US House in 2018, and that’s happening in and around Orange County, Simi Valley, and San Diego, and some of the diverse, agricultural counties of the San Joaquin Valley. In the long term, California lives as an example of a state where Democrats have successfully made an argument that social and racial liberalism is implicitly tied to economic liberalism, and used that to form a powerful electoral coalition. Matt McDermottMatt McDermott is a senior analyst for Whitman Insight Strategies. He tweets at (@mattmfm). William JordanWilliam Jordan is a former elections analyst at YouGov, and is currently studying public policy at Columbia University. He tweets at (@williamjordann).